Just a short note, as I have been down with a cold and need to catch up with posting. 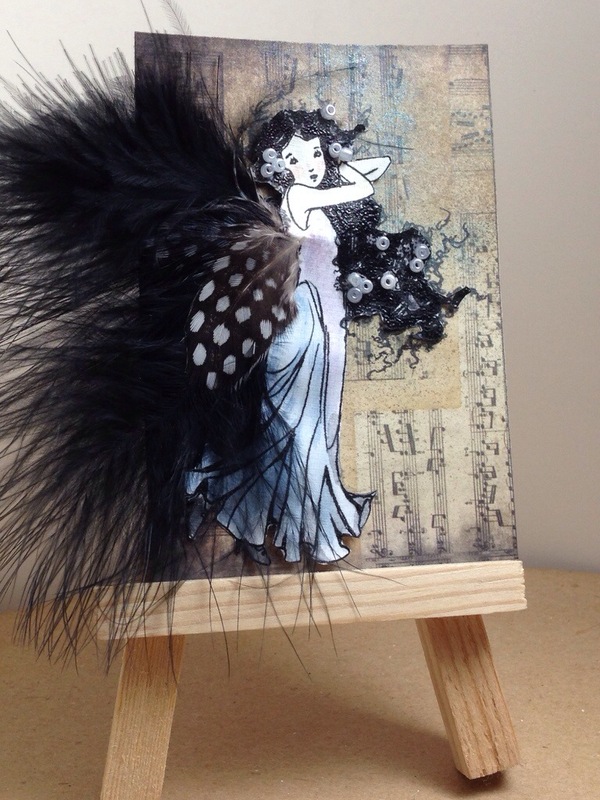 I have really been loving using gesso to “push back” busy papers. 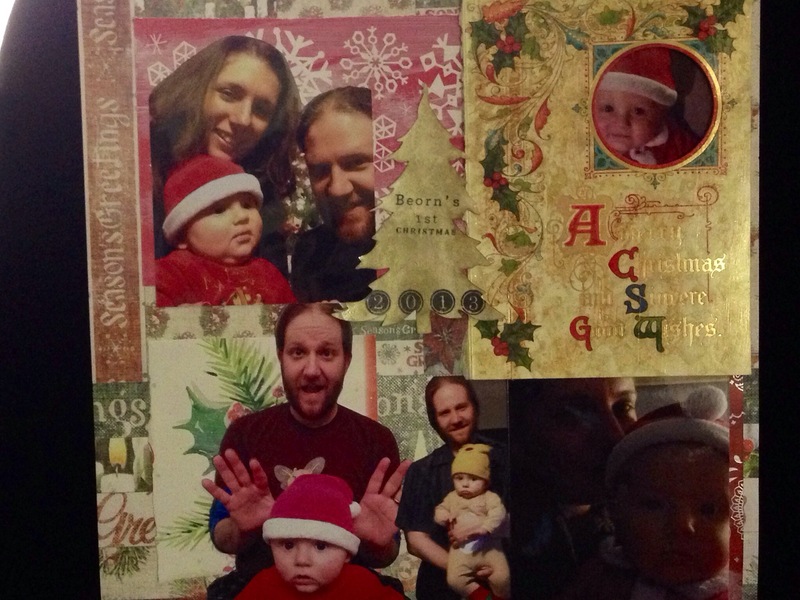 This has worked out great for my wish to reuse some of the holiday cards we received this year. 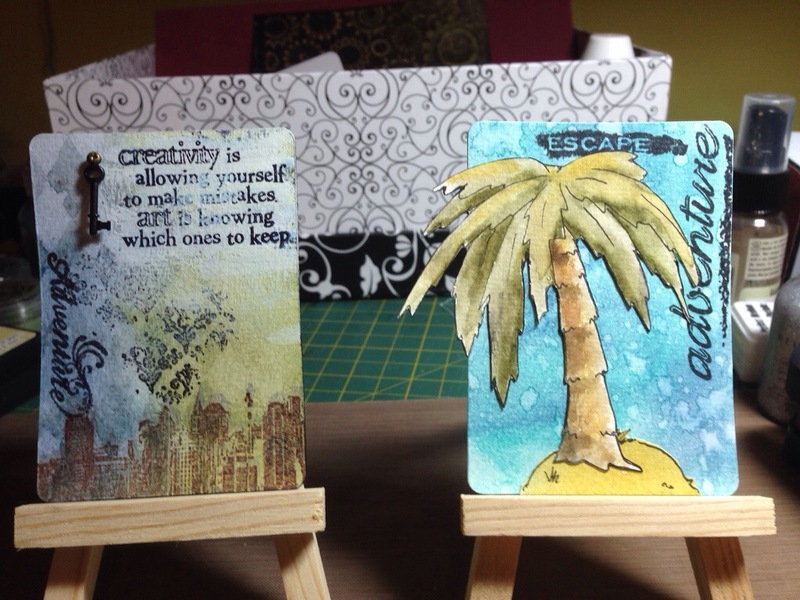 The gesso pulls together the different card styles. I think I could do more to pull it together, but this is a great start. The photo for the upper left circle window can be pulled up to see the whole picture. The gesso came in a sampler set from Faber-Castelle. I think I’ll need to get a whole tub of it when I run out! I have been working hard lately on improving the look of my blog. One of those improvements was to update the theme and background, including designing a special header. What do you think of my look? The next challenge has been to improve my “product” photography. Product photography is the art and science of making small objects look awesome. Since I work a desk job for most of the daylight hours (and Northeast Ohio isn’t known for it’s plethora of sunny days anyway), I don’t have the ability to stage photos with nice natural sun lighting too often. I usually do my crafting after my baby’s bedtime and pictures are often taken after midnight! So my photography set-up has to accommodate for my lighting deficiencies. My new photography set-up: A work in progress! My first step has been to address the background. A scrap piece of posterboard that has been rolled up in a corner for too long makes a nice seamless sweep. I just let it curl up around my sewing notions box. I did invest in an $18 Neewer reflector/diffuser thing that turned out to be about twice the size I imagined when I ordered online. Still, the diffuser part softens the light nicely and eliminates harsh shadows. 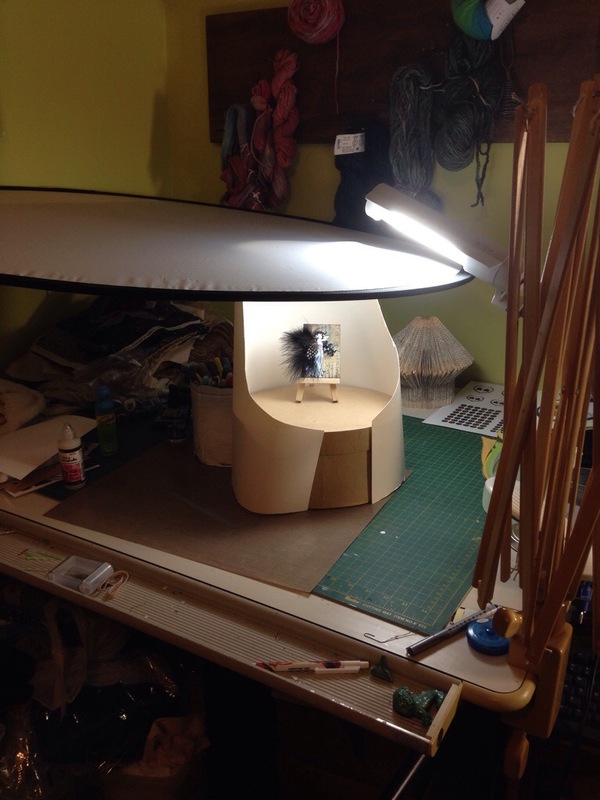 My Ottlight flexible desk lamp gives me full spectrum light – great for crafting and photography! You may have noticed that this setup is pretty small. Great for cards, ATCs, jewelry, and miniature figures for games. But I’m going to have to refine this set-up the next time I try to photograph a scrapbook page or something larger than 6×6! It’s always a learning process. Photos below are recent photos that could have used some help from the new set-up! In a previous post, I was lamenting the difficulty I was having in getting good stamp impressions out of some of my cling stamps. I did some research across various forums and websites, and here are some tips I ran across. I haven’t had time to try all of them, but my results are improving, and I am highly optimistic that after some experimentation I will find a method that works consistently for me. Not all clear stamps are the same. Photopolymer process stamps tend to be easier to ink, and work with, but also more expensive (e.g., Flourishes, Simon Says Stamp brand, My Favorite Things). Cheaper silicone or acrylic clear stamps might take more experimenting to get a good impression (e.g., Scrappy Cat, Inkadinkado). However, not all “acrylic” stamps are equal either. There are reports that a few brands (e.g., Penny Black, Recollections, Martha Stewart, Fiskars), are acrylic but are less squishable and less prone to image quality problems. Photopolymer stamps often have a weird initial smell, in case that helps identify what you have. Now that I know there is a difference, I realize that I haven’t had a problem so far with the photopolymer clear stamps, just the acrylic ones. And I’m curious now to try the “better quality acrylic” stamps, like the Martha Stewart ones I have picked up, to see if they less troublesome than other acrylic brands. Many users recommend using a mousepad, a pad of papers, or some other cushioning under the paper for a good impression. 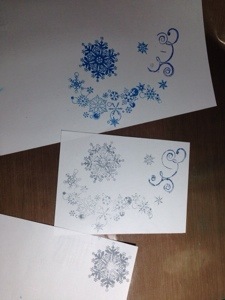 Make a test stamp on scrap paper, and try different paper types as well if image quality is a problem. 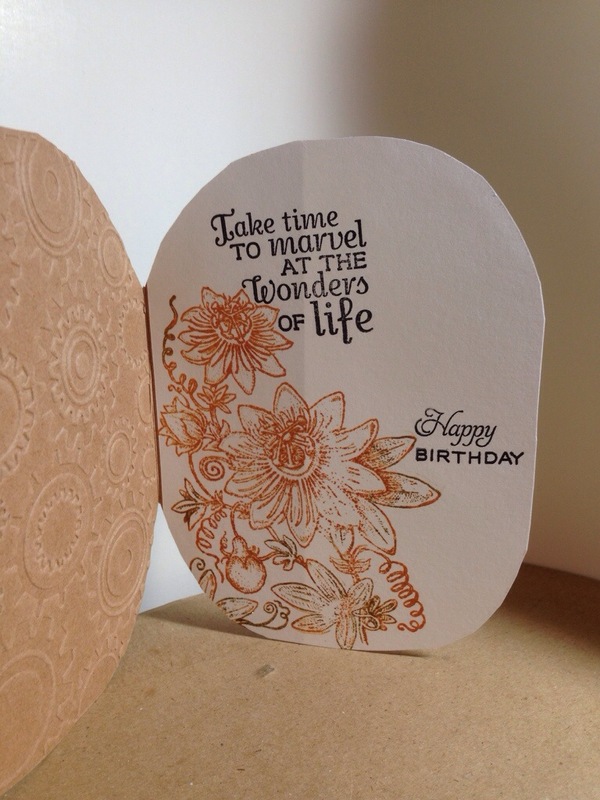 Be careful not to use too much pressure, as some clear stamps, especially smaller designs, can be squished out of shape causing a blurred impression. I have seen this problem on some small snowflakes that I have! There are some acrylic blocks that have foam feet that are meant to both give cushion and even pressure, although they seem like they would be annoying to ink to me! Of course, everyone has different favorite brands. But it seems that the acrylic stamps do better with types that are pigment-based, or water-resistant “archival” inks. Dye-based (e.g., Distress inks) tend to bead up on the surface of clear acrylic stamps, giving a poor impression. I have certainly experienced this, as most of the ink colors that I have are dye-based. I never realized there was so much variation in ink types! Solvent-based inks (e.g., StazOn) are supposed to lead to deterioration of clear stamps, although I’m not sure if this includes acrylic as well as photo-polymer stamps. It make sense to my mind that solvents would be bad on photopolymer, as I think it’s more chemically fragile. I would be surprised if the acrylic stamps were as susceptible to damage from solvent-based inks. A lot of people in forums specifically mentioned having good luck with Colorbox Chalks on clear acrylic stamps. Although both Colorbox and Colorbox Chalks are pigment-based, the Colorbox Chalks are considered quick-drying while regular Colorbox have glycerin-extended drying times to make them better for embossing. I suspect the glycerin would cause beading up just like water-based dye pads. The manufacturing process may leave residues on the acrylic stamp. Supposedly this is not an issue with photopolymer. Washing clear stamps with mild soap and warm water may help and certainly won’t hurt. After reading this tip, I used a strong light and looked at some of the stamps that I hadn’t used yet (and had never cleaned). I noticed that the unused acrylic stamps did seem to have a bit of slightly yellowish residue on the surface. Cleaning the stamps well did seem to help the impressions a bit, but alone did not seem to be enough to get a perfect image. Avoid using solvent-based cleaners and cleaners meant for removing solvent-based inks, as these may lead to deterioration of clear stamps. I am providing these tips, with warnings, because sometimes it’s better to use a potentially tool-destructive method than not be able to use a tool at all. I am optimistic that these won’t be necessary if some of the other methods are employed first. SEE ABOVE WARNING*: Some users recommend scuffing the surface of the acrylic stamp with a pink or white eraser. More recommended the pink. UPDATE: I have discovered that Bo Bunny Stamps recommend on their packaging to rub their stamps with a pink eraser before each use for better inking. So maybe this is not such a dangerous idea after all. SEE ABOVE WARNING*: Even more scary, some users had success scuffing the surface of the acrylic stamp with very fine sandpaper! I would say this should be a last resort. SEE ABOVE WARNING*: Some users had positive results by inking the stamp first in an archival or solvent-based, letting it dry, and then inking in the desired manner. As an added step, some of these users recommend never cleaning off that initial layer of ink. Again, not recommended because of the risk of the stamp chemically deteriorating over time. Double stick tape, or Aleene’s Tack it Over & Over will get the job done. So that’s what I’ve learned over the past few days! I’ll try some of these methods out over the next several days as I finish up my holiday card-making. I have to say it’s a little frustrating to find that these acrylic stamps are so fiddly, since I have a few of them around. Hopefully, I will get a good solution worked out.